This was the day, of the third attempt for Ross Grange and me at raising Yukon from her rather inglorious resting place in Dragør Harbour about twelve kilometers south of Copenhagen. We had been thwarted on our first attempt 2 Sundays previous by an inadequate floating crane. We had our sums seriously wrong the owners had told us Yukon weighed in at twenty-eight tons. This in fact was her Gross registered tonnage (GRT) not her displacement, which is around sixty tons. The first crane strained and struggled with alarm buzzers sounding out across the small harbour basin, the slow sideways shake of the operators head signed the death knell for this attempt and this day, kiss that thousand bucks good bye. We had been working well within budget Ross an industrial diver and fellow antipodean living in Copenhagen had kindly volunteered his time, to appraise the hull, patch any obvious holes, run slings borrowed from his salvage company employer, welded up a spreader frame to hold the slings at the correct angle, procured shackles. He had also managed to organize a floating crane through a friend met in a nearby establishment of good repute. To no avail, a bigger crane was without doubt the order of the day. Yukon had lain on the bottom for the second time in six months in about four meters of water alongside her jetty for a couple of weeks this time. I had been in negotiation with her owners to purchase her and finally nailed down a price when she had sunken for the second time lots of small holes and shoddy bilge pumps were the culprits. 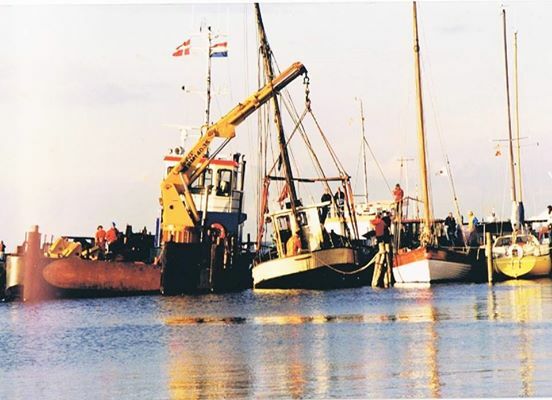 An agreement was draft in Danish and English ‘I would cover the cost of salvage if I choose to take over the vessel after I have managed to raise her and tow her to a slipway and have had 24 hours to check her over once out of the water, oh and a case of beer for the owners’. The next attempt Sunday the 15th of June had been better. We had found a bigger crane. We had left all the gear rigged. Slings, frame, shackles the lot. The wait between attempts was biting into my patience and the harbourmasters as well, we were all moonlighting including these mysterious cranes that Ross procured, they were otherwise engaged in the construction of the massive bridge spanning Oresund between Denmark and Sweden. I was lucky to get these guys, right time right place 1000 bucks a pop, ouch. Attempt number two ended without success, but we did manage to lift her for about 5 seconds I saw Yukon’s stern and about two thirds of her water line on the starboard side. The crane couldn’t hold her long enough for the pumps to do their work, “sorry mate” we have to put her back down again nice and easy see you next Sunday … more pumps. Driving down to the sight on the morning of the 22nd I had a gut feeling that it was this time or it would be without me, paying all this money, the coffers were becoming depleted, someone else can worry about it. The Harbourmaster who had been pretty good with us over the previous weeks had drawn the line as well. He would be forced to drag Yukon out to the spoil ground with a tug it would destroy her! Third time lucky? The local community had followed our efforts with interest and enthusiasm, this bloody Aussie and his mate were starting to struggle. The fire brigade came to the party, with two mega pumps and a stack of volunteers to help, coffee and cake in true Danish style, the crane driver nodded in approval at the scene unfolding before him, his third Sunday in a row. The lift began easy as if a formality the lowest point of down flooding; the point that had to be lifted above the water before the harbour’s ingress could be turned was the portside aft corner of Yukon’s main hatch. This sat about six inches above the deck line it was pretty bloody tense. Alarms were ringing on the crane and in my head as the deck line began to clear the surface, such a beautiful boat so close yet, all pumps had been fired up – and were removing heaps of water but to no avail, the crane couldn’t do it, six bloody inches more to stop the ingress. We could build a box, a cofferdam around the hatch; time was running out, a murmur of defeat rippled through the crowd people were losing interest the scenario was wearing thin. I realized all eyes were on me. I had to make the call; we just needed a little more buoyancy… Buoyancy: displace water to give the vessel less weight. I gingerly climbed down on Yukon’s deck she was equipped with two eight man life rafts, these were the only shot left. I maneuvered them toward the open hatchway slipping around on the silt-covered deck, Ross could see the plan as it formed in my mind, and together we pushed them down through the hatchway and into the main hold. They lay bobbing around in limbo below deck I inflated them both, yes! The crane alarms stopped, Yukon rose ever so slowly, just enough to allow the pumps to do their work. It was working she was starting to float again! A cheer went out over the small harbour. We had done it. Saved!